KenDarious’ mother, Tanyika Smith, was holding the baby as invaders shot her, her mother and a friend. KenDarious was killed. Photo by Lauren Ramsdell. A coalition of DeKalb pastors is offering a $5,500 reward for information leading to the arrest of suspects who killed a 9-month-old baby. 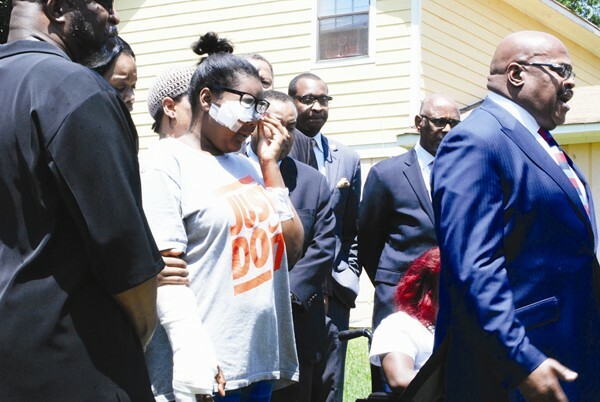 Bishop Quincy Carswell of The Covenant Church addressed the media surrounded by worship leaders from across the county, as well as the family of KenDarious Edwards Jr., who was killed in a home invasion May 10. Carswell and the other pastors are members of a group called Right Choice Pastors Coalition, which partners with local police and schools to offer tutoring, mentoring and after-school activities for children in the community. Police say that a group of two to three men broke down the back door of a home on To Lani Farm Road in Stone Mountain late on May 10. Tanyika Smith, the mother of KenDarious, said the family was at home when they heard a knock at the door. Smith, her mother Tracy Smith, and a friend were all shot multiple times but have been released from the hospital. KenDarious was shot in the chest, arm and stomach, and did not survive. The shooting is believed to be in retaliation for the death of Alexis Malone, a potential witness in the May 3 shooting death of Michael Phillips. KenDarious’ uncles, Oslushla Smith and Cutrez Johnson are suspects in those killings. The home invaders’ identities are currently unknown. Carswell said that those who provide information to the police or Crime Stoppers will remain anonymous. Carswell also added that the family needs assistance with fixing the broken back door, food and potentially a move out of the neighborhood.